This week, as I walked around Unveiled with Wellington fashion designer Alexandra Owen who was prepping for her Thursday floor talk, she stopped in her tracks in front of this dress. Monica Maurice’s wedding dress, 1938. Worn by Miss Monica Maurice and given by her family. Collection of the V&A. 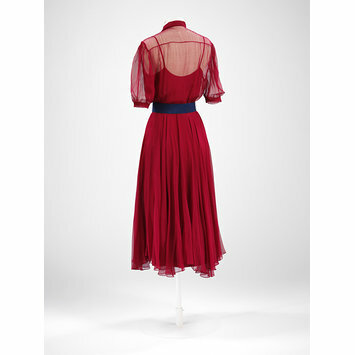 The dress was worn by Monica Maurice for her wedding to Canadian doctor, Arthur Jackson (1904-1985) in South Yorkshire in 1938. It is made from fine silk gauze, and is accented with a blue petersham belt and buttons. The spirited Monica Maurice on her wedding day. Collection of the Victoria and Albert Museum. Of all the colours an English bride could choose, red is a particularly brave choice, and some would even say brazen given the racy associations of red in Western culture. However, red was one of Monica Maurice’s favourite colours, and she was not one to feel that she had to follow convention. In 1938 Monica married in red, made the decision to keep her maiden name, and became the first – and until 1978 only – woman member of the Association of Mining Electrical Engineers. 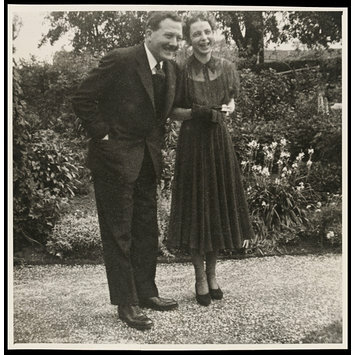 Monica – who had studied languages and design at the Sorbonne, in Paris, and at Hamburg University in the late 1920s – worked for the Wolf Safety Lamp Company, a safety lighting engineering company owned by her father. Her expertise in the area, and proficiency in languages, were such that in 1947, she participated in a British intelligence overseas survey mission to Germany to ‘determine the extent and subsequent recovery in certain specialised industries’. She had the rank of lieutenant-colonel! After her father’s death in 1951 she took over the company, and as her son recalls in his 1995 obituary was faced with restructuring and rebuilding ‘lost markets and demands’ in a post-war climate (while also raising three children). Rebuild she did. Today, the company remains family owned and recognised as a world leader in ‘lighting for safe use in explosive atmospheres’. On 21 February 2012 the Museum of Sheffield opened an exhibition celebrating the company’s centenary. While Monica operated astutely in a man’s world – she also had a passion for racing cars and flying – she accessorised her ‘steely determination’ with striking and stylish clothes. On seeing this dress Alexandra Owen marvelled at its contemporaneity, and the skill of the unknown dress-maker. Alexandra noted that while similar dresses can be seen on the world’s runways today, very few exhibit the delicacy inherent in this dress. It is a characteristic she feels has come from time and effort spent on both the pattern making and the dress’ realisation, from the tucks at the shoulders to rolled hem. She especially admired the hem which has been painstakingly hand rolled. Cut on the bias, the skirt hangs unevenly. Typically, skirts cut on the bias are left to hang overnight to develop a natural fall, and are then trimmed. Monica’s dressmaker, however, chose not to trim, which gives the dress an added joie de vivre. The skirt, which has been cut on the bias falls unevenly but prettily. While Monica’s dress-maker’s name has been lost from history, her skill is really to be admired. ‘Wedding Dress of the Week’ is posted in association with Unveiled: 200 Years of Wedding Fashion from the Victoria & Albert Museum, London which is on display at Te Papa until 22 April 2012. This was a standout for me at the exhibition and as for Monica – what a gal. I fell in love with this dress when I saw it in the exhibition last week. I love it more now, knowing something of the wonderful woman who wore it. My daughter looked stunning in red silk on her wedding day 2 years ago, especially standing on the waterfront with the wonderful Wellington sky and harbour behind her. My daughter sent me a postcard of this dress from Te Papa and I love it very much. 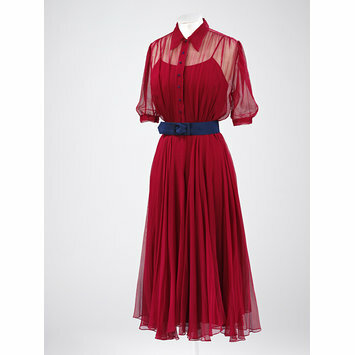 I think if we had been able to make copies of this dress for the Te Papa Store, half of the women in town would be skipping and swirling down the street in red! For replica vintage garments its always worth keeping an eye out on the V&A Shop website -they have recently had replica Horrockses print dresses in stock.